On the wooded estate side of the A1214 stands the majestic Milsom's, oozing class, money and peace. 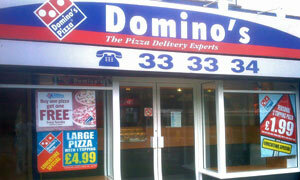 On the housing estate side of the A1214 stands the defiant Domino's, oozing cheese, mozzarella and pizza. One of these competing establishments is a tad more affordable than the other. Clue: it's the one with the phone number you can dial when drunk. Collection Only. Available Until 4pm Every Day. Some menu selections pick themselves. Chicken, smoky bacon and BBQ sauce for me, aka the key ingredients to a Texas BBQ. Andy seems to get away with ordering four toppings, and we hand over our two quid coins. Then it's next door to the dead handy Dobbs General Store (ex-offy) for 330ml cans of fizzypop and a sub 10 minute wait on the wall outside. They're ready! Over to the bus stop bench -- let's be civilised -- and let's dig in to our foodie frisbees. Hot, fresh, really tasty and just the right size. We've had far worse than this on our many travels and paid a lot more for it. Would it be so wrong to want a personal pizza for lunch every day? If it was a car -- Daihatsu Domino. If they were passing by -- Dave Spikey.